Sources tell me the Bobcats have an opportunity to sign a starting PG capable of averaging 15ppg with a stellar 2:1 assist to turnover ratio. He shoots better than 33% from downtown, nails 90% of his freebies and has a true shooting percentage of 54%. Excited yet? Well good news Bobcats fans, they do and his name is D.J. Augustin. You probably remember him from his previous stint with Charlotte, y’know, just a few months ago. While his name may not have the allure of “Jerryd Bayless” or “Goran Dragic“, it’s through not fault of his own. Just as in our personal relationships, things can go stale as they become overly familiar and the story of Darryl Gerard is no different. 2010-2011. The only season that matters. It was November 2010, the Bobcats had just come off of their inaugural Playoff berth. How did they celebrate? By cleaning house of course. You see, Michael Jordan, Larry Brown and Rod Higgins had received a secret memo from the league office detailing a mysterious concept referred to as a “Salary Cap”. Turns out you can’t keep taking on other team’s heinous contracts forever. Yes readers, the organization was shoved into a corner financially, forcing them to let 2005 Lottery point guard Raymond Felton walk without any compensation and salary-dumping future Defensive Player of the Year Tyson Chandler to the soon to be NBA Champ Dallas Mavericks in what might be the WORST trade in Charlotte Pro Sports history. The one positive to come from all of this pre-Rich Cho nonsense was that third year prospect D.J. Augustin was finally given a chance to lead the team. For those of you who don’t remember, I’ll sum it up: He did great. Not Derrick Rose great mind you but Charlotte Bobcat Lottery Pick great. D.J. scored, dished, stretched the court, amassing the stats referred to above. He did this during a year of turmoil which saw his coach fired, his team’s only “star” traded, a season in which Kwame Brown started 50 games--that in and of itself should be enough to earn a lucrative contract extension. But here it is July 9th, 2012 and D.J. doesn’t have a contract; not even a rumoured one. He’s technically a free agent and any team in the league may sign him to an offer sheet yet no one has. Last season didn’t help. Augustin missed twenty starts due to injury and had yet another Bobcat Lottery point guard waiting in the wings. “What more must I do?” he must have asked. “Two coaches, two point guard controversies in four years, a completely gutted roster and now they want to low-ball me in free agency after practically destroying my market value.” Extreme? Maybe. I would rest my case on the one year in which the team fully committed to D.J. Augustin, he delivered. As it stands now, neither side is close to “winning” this game- Cho’s rebuilding project has decimated the roster and players like Augustin aren’t built to carry the entire load. Thus his value is negated and can’t be showcased properly for potential suitors. He’s like the complex film plot that can’t be sold in a thirty second trailer. Put D.J. on a decent team and he’s probably at worst in the Kyle Lowry zone. Best case scenario for both Augustin and the organization is either a sign & trade for another decent prospect or draft pick. If that type of offer isn’t on the table, I’d prefer the team to sign him to a reasonable $5-$6million per year deal and let the two PGs battle it out for supremacy. Augustin will turn 25 during next season and has shown marked improvement during his development. If he plays lights out, trade him in the summer or entertain offers for Kemba Walker. Either way both sides have something to show for the tumultous journey that they’ve traveled together. PART I – What Just Happened? A. Every media outlet in the universe reported the team was working to trade down. B. Out of all the draft’s top seven prospects, MKG is the least offensively polished – not exactly a perfect fit for the league’s worst offense. C. The team’s only power forward under contract is a guy whose effort was so infuriating last season, he provoked a 68-year old man to pull a reverse Spreewell on him. So why did Charlotte forego dreams of a sure-fire big man starter at #4 (Thomas Robinson) and another prospect at #24 (Tony Wroten, Perry Jones or Marquis Teague) in order to keep the pick and draft an 18 year old with a broken jump-shot? Don’t skate to where the puck is, skate to where it’s going. And judging from last month’s NBA Finals, the puck is going to an UBER-ATHLETIC place in which only the crazy-long, high of energy may roam. Lebron James. Kevin Durant. Paul George. Luol Deng. Rudy Gay. Iggy. Danny Granger. Chris Bosh. Derrick Rose. John Wall. Thomas Robinson only covers one of these guys on a good day. MKG can match up with ’em all. Robinson is an old-school bruiser who could’ve banged with Charles Barkley or Karl Malone back in the day. Meanwhile, this year’s Finals featured James and Durant playing the bulk of his team’s minutes at the four spot. I like Robinson but there’s no chance he’s checking either of those guys. By adding Gilchrist to a squad which already includes Gerald Henderson (a near lockdown defender at both guard spots) and Bismack Biyombo (still developing but a defensive juggernaut in the making), the Bobcats have three players who could legitimately challenge for All-Defensive team in the near future. MKG also fits perfectly with new head coach Mike Dunlap’s philosophy of fitness, effort and easy transition buckets. Good news, coach, MKG isn’t just “fit” he’s “relentless”. No player on the roster has been able to make Gana Diop or Tyrus Thomas feel bad for giving less than a 100% thus far but I think Gilchrist the “Culture-Changer” has a shot. The team just announced it’s extending qualifying offers to both D.J. Augustin and Derrick Brown. I’d bet on Brown being on the roster in November – he fits the mold described above. Augustin? This seems more like a strategic move – He has value but I‘m not certain he’s in the team’s long-term or even short-term plans – so don’t be surprised to see a sign & trade go down later in the summer. By not qualifying D.J. White, the front office announced that they’ll be going after another power forward via trade or free agency. Again, considering the new philosophy, they’ll be looking at players who can play both big man positions, run the floor and affect the game defensively. Jason Thompson (RFA) and J.J. Hickson (UFA) will certainly be high on the list. Considering Hickson’s perceived character questions, Thompson seems like an ideal fit. I’m also a fan of Ersan Illyasova but expect his asking price to be far north of what the Bobcats can offer. Potential sleeper: Toronto’s Jerryd Bayless (RFA) is a big-time paint scorer and could be had via sign & trade (Reggie Williams’ expiring – Raps will need shooters around Jonas Valanciunas); especially if Toronto ends up using all of their cap space on Steve Nash in the next few weeks. Finally, I would love for the team to invite Iona State PG Scott Machado and/or Georgetown C Henry Sims to camp as undrafted free agents – perhaps their agents could be enticed with the promise of playing time. Not bad at all. Scoring from the guard spots, MKG can slide over and check fours during small-ball lineups. This team doesn’t win 30 games necessarily but is set up very well moving forward especially if Tyrus rebounds from a wacky ’11-’12 campaign and if Byron Mullens rebounds (at all). Two lottery picks next summer, another $10-15 million in cap space, amnesty provision card in their back pocket and another year of growth for their young players. The Bobcats’ future is bright and that might be the biggest surprise of all. *anybody who can manage to get Cory Higgins on an NBA roster is crafty to say the least. We’ve projected how next season’s Bobcats roster could look if they draft Thomas Robinson or Bradley Beal. Next, we’ll take a peek at how things could shape up should Higgins, Cho and company choose a riskier path. This time last year the 2012 NBA Draft was deemed the best draft class since 2003—a crazy deep draft featuring LeBron, Melo, D-Wade, and Chris Bosh. We’re less than a week out from selection day and that doesn’t appear to be the case. Anthony Davis may end up having a similar impact to those four players but after him there isn’t another surefire superstar. Instead, the Cats will have their choice of five equally-warted but promising players. 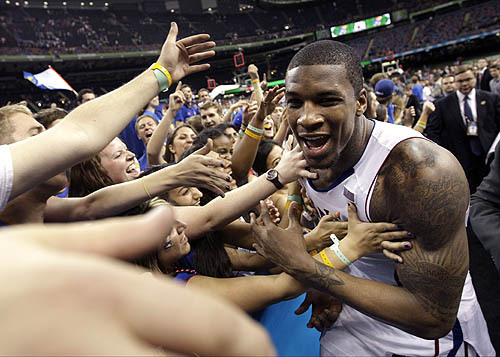 Thomas Robinson doesn’t have the highest ceiling. 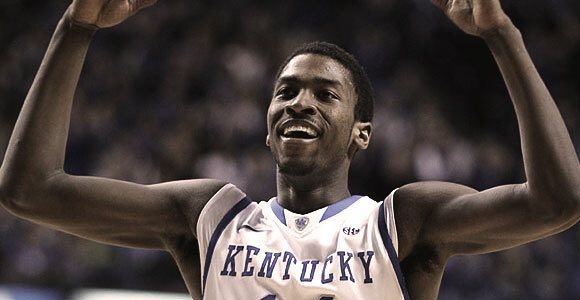 Michael Kidd-Gilchrist has a broken jump shot. Bradley Beal is undersized. Harrison Barnes had a disappointing sophomore year. Andre Drummond has motor issues. With all due respect to Beal (and I’m a huge fan of him), only one of those five has the potential to become a true superstar—one of the three best players at his position. In a season in which the Bobcats can’t get any worse, why not take a chance on Andre Drummond? 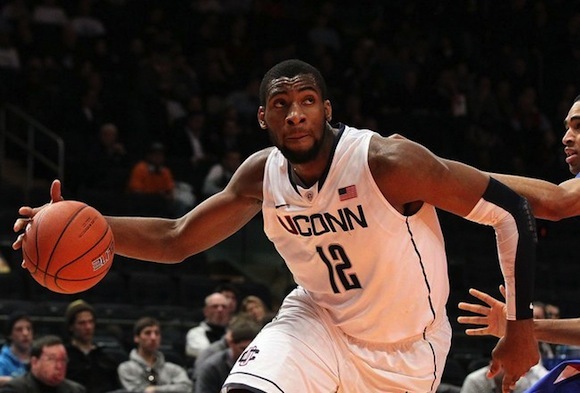 Drummond is one of the tougher players to grade in the draft because he has so much talent but didn’t leave a spectacular impression after one year at UConn—not to mention how volatile young big men can be in the draft. He could be the next Andrew Bynum or even Dwight Howard, but a more realistic projection might be former Bobcat Tyson Chandler. Then again, he could fizzle out like the man who went directly before Chandler in the 2001 NBA Draft: Jordan’s nemesis Kwame Brown. The Bobcats had two main problems last year: they couldn’t stop teams from scoring at the basket at will, and they didn’t have a star. Drummond can fix both problems. Points: D.J. Augustin is a restricted free agent and I can’t see him returning to Charlotte. When he wasn’t hurt last year, Augustin looked disengaged and the team clearly sees Kemba Walker as the future. Charlotte won’t be able to trade him in time to pick up an extra draft pick this year, so I expect them to deal him later in the offseason to a contending team for a mid-to-late first-round pick (think Dallas, Memphis, or the Lakers). In D.J.’s absence, Cho will then need to add another point guard or two, so I expect him to pick up a big, veteran guard (perhaps Royal Ivey or Keyon Dooling) and a Shannon Brown-esque reclamation project (maybe Jonny Flynn). Wings: Charlotte still needs offense from somewhere, and the perimeter would be a good start. I have a feeling some quality wing players will be on the board for the #31 draft pick. Maybe that’s John Jenkins, Will Barton, Quincy Miller, or Jeff Taylor (who Chad Ford’s latest mock draft has slated to go 31st). Additionally, the Bobcats still need more three-point shooters, so Cho could take flyer on another young guard: James Anderson. He never got much playing time in San Antonio but the 23-year old lit up the Big 12, averaging 17.9 ppg on 37.5% shooting from beyond the arch over his three-year stretch at Oklahoma State. Brandon Roy would be a fantastic addition (and would help cast away demons from the ‘06 draft), but he’d likely prefer to go to a contending team like Miami or Boston. Bigs: Bismack Biyombo, Andre Drummond, and their combined 14’11” wingspan will immediately alleviate Charlotte’s interior defense problem. There won’t be much offense immediately, but they should grow to emulate OKC’s defensive frontcourt of Serge Ibaka and Kendrick Perkins. Byron Mullens and D.J. White can bring short spurts of instant offense, and anything Tyrus Thomas brings will be gravy. It’s not a fantastic group, but there’s a lot of potential down low, and they won’t give up nearly as many easy buckets as last year. RESULT: Charlotte signs James Anderson and Jonny Flynn to 2-year $5 million deals and Royal Ivey to a 1-year $1.25 million deal, drafts Jeff Taylor, sign-and-trades D.J. Augustin for a future 1st round pick, and extends a qualifying offer to D.J. White. The bottom line that winning 15 games and winning 25 games isn’t much different—neither team makes the playoffs. But the 15-win team gets a better draft pick. This Bobcats team is better than the dreadful 2011/12 Bobcats team, but then again, you could multiply last years win total by two and a half and still have the worst record in the league. Charlotte probably won’t find their Kevin Durant in this draft. That ship sailed when Adam Silver announced those fatal words: “The second pick will be made by… the Charlotte Bobcats.” But their Kevin Durant may come around in the next draft in the form of Shabazz Muhammad—or even two years in the future in the form of Jabari Parker. The worst thing the Bobcats could do is eat up their precious salary cap space with a terrible contract while they’re not competitive. Michael Jordan needs to bide his time until his Kevin Durant comes along. And until then, I think they should roll the dice on a potential superstar (Drummond) and some potential role players (Taylor, Flynn, and Anderson). Last week we built out the Charlotte Bobcats ’12-’13 roster post-Thomas Robinson, this time we’ll take a look at what Rich Cho, Rod Higgins and new head coach Mike Dunlap will need to do if they go a different route. Dunlap insists the Cats will be more aggressive on offense, converting easy baskets while doing their best to minimize those same shots on defense. That’s wonderful news and I’m certain that eventually the hustle plays will cut down the team’s dreadful -13.9 point differential and maybe even swing a few close games their way. In the meantime, the Cats can buy themselves a little breathing room by employing players who can increase the team’s offensive output the old fashioned way: Scoring the Damn Ball. Bradley Beal has been compared to Eric Gordon, Ray Allen and Dwayne Wade: not only good company but rare company. There just aren’t many big-time scorers in the game. Beal instantly becomes Charlotte’s number one offensive option and most feared shooter. Concern over his 6’4″ height or with how Beal affects Gerald Henderson’s role with the team are mitigated by Beal’s ability to play both guard positions. The team’s guard rotation of Augustin, Henderson, Walker and Beal becomes one of the league’s best young backcourts. With the backcourt set, Charlotte will need to address depth at both the 3 and the 4 spots. 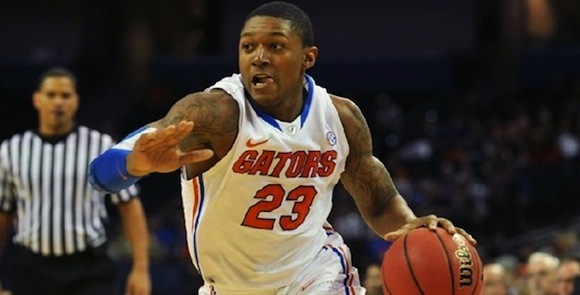 SF: Drafting Beal gives Dunlap the option to go small with Henderson playing on the far wing. He’ll need to get comfortable there because incumbant and veteran placeholder Corey Maggette is a near lock to miss a dozen or so games due to injury. Derrick Brown is a replacement level backup as well as a free agent and may not be invited back. PF: This is why everyone’s reading Thomas Robinson as the pick. Once you pencil in Bismack Biyombo as a full-time center, the Cats collection of power forwards looks downright ugly. D.J. White is a fine backup with a nice 18 foot jumper but doesn’t defend all that well and has no post game. Tyrus Thomas? Who knows what you’re gonna get with the guy. He could end up averaging a double-double or be out of the league entirely by season’s end – how often can you say that about a six year veteran? Again, I’m optimistic the team will get a call from Antawn Jamison’s agent come July and he’d certainly bring a much needed dose of professionalism and experience to a young team. I’m also convinced that Cho will try and trade up from the 31st pick to nab another frontcourt prospect, especially if they go Beal early. Jared Sullinger, Quincy Miller or Moe Harkless might be worth the move up. RESULT: Charlotte signs PF Antawn Jamison to a two year $8m deal, drafts PF Quincy Miller in the late first round, extends QO to D.J. White, D.J. Augustin. World Beaters? No, but a much more competitive lineup than last season especially given the boost in fire power. These Bobcats push to win 30 games, enter next year’s offseason with two 1st rounders, upwards of $30 million in cap space and lots of teal and purple (but that’s another story for another day). POLL : What Should They Do with Pick #2? Not only is Thomas Robinson the safest pick at two but by selecting him the Bobcats can follow a fairly straight-forward path building out the rest of the roster come July. At 6’9″/244, Robinson instantly becomes the team’s muscle down low; he’ll likely lead the team in rebounds his rookie season and challenge for highest PER. If the Cats do select T-Rob, expect a stream of happy tweets from Bismack Biyombo, who’ll be surprised to find a competent frontcourt brawler crashing the boards next to him in the paint. Long term, the combo of Biyombo and Robinson form a high(ish)-ceiling big man duo to build the team around. Add in a change of pace stretch five (Byron Mullens), a (hopefully) refocused Tyrus Thomas* and the Cats frontcourt suddenly becomes a strength. With the frontcourt out of the way, the team must address its #1 area of weakness: SCORING. Robinson will help a little but what the Cats desperately need is a legit 20-30 point threat capable of drawing a double-team or cracking a pick ‘n roll — y’know, those components which make up 90% of NBA offenses. GOOD NEWS: Big-time scoring wings are available this offseason. Danny Granger, Andre Iguodala and Rudy Gay can all be had given the right trade. BAD NEWS: Even if the Cats wanted to take on a big-salaried veteran, the team might not have the ammo required to make a deal happen. Oh, and don’t look for any firepower in free agency, it’s simply not the year for it (#2013). The most likely scenario is that the team signs some low-risk/low-cost veteran help in the form of Antawn Jamison or Grant Hill to shepherd the kids until Shabazz Mohammed*** or James Harden come along. RESULT: Bobcats extend/sign D.J. Augustin to the $4.4m qualifying offer, sign Antawn Jamison to two-year $8m partially guaranteed deal. Factor in the team’s high second-round pick (a potential rotation player) and the roster maxes out at fourteen with a cap number around $55m — right around the league mandated minimum. Will this roster be decent? Probably not. Will they be as bad as last year? Nope. The coaching change alone should be good for a handful of victories. Robinson’s ability to finish in the paint and rebound will be a godsend while Jamison’s scoring punch from the bench should prevent some of those mid/late quarter collapses. RESULT: Charlotte team looks better, finishes strong, wins 27 games, enters July of 2013 with a handful of good young players, two first round picks, a ton of cap space and lots of teal & purple. *And, no, I refuse to believe that the Bobcats will amnesty Tyrus simply because: a.) The team is broke and b.) No one outside of Billy King would offer T-Time guaranteed money to offset the costs. Also, “T-Time” is the second laziest nickname in the league, right after “T-Rob” and just behind “Hendo”. ***Is Shabazz Mohammed the next great NBA prospect or the leader of the Black Panther movement? Name always confuses me. The Charlotte Bobcats have started nearly all of their first seventeen games deficient in talent; they’ve ended most of them deficient in effort. Not exactly the sort of problem you would have expected from a young, Paul Silas-coached team. So who or what is the culprit for this early season malaise? Out of shape, neurotic and enigmatic, Boris “Ladyhips” Diaw has been the poster-boy for the Bobcats ennui. His 27 point outburst against the Knicks notwithstanding, Boris has been relegated to the bench as his perpetual disappearing act had driven the coach, ownership and fans one step too far. DJ White has clearly outplayed him thus far. The team is committed to Tyrus Thomas for another three seasons. Bismack Biyombo isn’t ready enough to play center full-time. The Cats would love to rid themselves of Diaw’s expiring contract in order to allocate precious developmental minutes to the other three but how many teams in the league have both the need and the expiring contract Charlotte would require to make a deal? The Knicks and Suns would seem the logical answers but neither of those teams have the types of players/assets the Bobcats would need in return. Baseline’s own Ben Weinrib postulated a Clippers scenario that could work but Charlotte may have to resort to benching Diaw for the remainder of the season and wait for his contract to expire in July. @Baseline DrE noticed it from game one: Corey Maggette looks spent. His jumper isn’t falling, he’s not getting to the line, he’s consistently a step slow on D and a strained calf has sidelined him for most of the month. This is all bad news considering that Silas practically designed the entire offense around him before the season started. As is stands, the team is paying him $10 million this season and still owes him another $10 million for next. While the entire concept of “amnesty-ing” a player must stink to a small market squad like the Bobcats, one could only imagine that’s it’s being discussed, especially if the team can somehow convince a big name FA to take their money. That’s probably not going to happen so look for Maggette to remain in Cat-stripes until the summer of 2013. Classic Bobcat conundrum: Your strengths are your weaknesses. D.J. Augustin has really elevated his game this season, thus putting rookie point Kemba Walker in a primarily off-guard role. This works ok about 30% of the time, meaning the 30% of the time Kemba makes his “head down, Monta-Ellis-inspired” step-back jumpers. The problem isn’t that Kemba isn’t a good enough a shooter yet, it’s that he’s learning a lot of bad habits that may come to limit his impact and future growth. Kemba will need to play PG in the NBA. A decent team simply can’t start a six foot two guard and expect to win many games. He’ll need to learn how to distribute first, work the opposing defense and manage the game, shooting only when necessary. I don’t think the damage is irreparable but Coach Silas will need to transition Kemba to the role of PG sooner rather than later in order for Walker to rise above his current ceiling as “a rich man’s Nate Robinson”. Mullens-mania has been one of the few bright spots over the past month. The young man has a nice shooting touch, good offensive feel for the game and seems to give half a crap about improving. That’s fine. The problem is that Byron is a textbook turnstile on defense with the opposing offense going right at him as soon as he checks into the game. Weak-side help defense? Fuh-get about it. Unless BJ can bulk up and learn some killer mano y mano D during the offseason, his primary role in the league will be that of a 20 minute a night backup/change of pace center — which, by the way, isn’t a bad thing at all. It sure as heck beats playing in the D-League. This is the most surprising issue of all. Paul Silas’s mission for the season should be clear: LOSE GAMES, DEVELOP YOUNG PLAYERS. Good for tanking games? Yes. Good for developing prospects? No. Good for desecrating the sport/wasting fans money? Absolutely. Still only 24 years old, “Hendo” has become the rare sequel better than the original. While he’ll probably never develop into a team’s go-to scorer, Henderson’s gifts as a shut-down defender and his ever-improving jump-shot make him a bona-fide starter in the league. Henderson started driving to the lane more in the last few games, getting to the line and drawing fouls. His ho-hum PER might not reflect it at the moment but Henderson is THE LONG TERM solution at two guard. You gotta love the fact that Augustin has stepped up in the face of a challenge. Kemba should be taking notes: D.J. notched a near 3:1 assist to TO ratio during the first sixteen games of the season, nailing 38% of his three balls while averaging 15 ppg. He’s a restricted free agent after the season and I don’t see a scenario in which the team doesn’t re-sign him. Fortunately with Rich Cho running the negotiations, Charlotte fans needn’t worry about the team overpaying. The issue of course is what to do with Walker. Kemba has an incredible set of intangibles and is already a much more dynamic scorer. With a couple of seasons learning the position, Walker could be in line for the starting gig. If Cho can ink Augustin to an attractive contract, the Bobcats may find themselves with an ideal trading chip a year plus down the road. He didn’t exactly burst onto the scene but in limited appearances, the big man has shown flashes of incredible defensive potential. First off, he’s a physical freak. Apparently the “strongest” and “toughest” guy on the roster, Biyombo’s build is deceivingly slight. During warmups last week I saw him stand next to D.J. White, a legit 6’9″ PF. Same height but while White’s arms dangled around mid-thigh, Bismack’s fingers nearly touched his kneecaps. Jay Bilas just climaxed reading that. Opposing offensive players are noticing too. Biyombo is averaging nearly 5 blocks per 40 minutes of play and subjectively you can see players alter shots, launch high floaters or avoid the lane altogether when he’s in the game. I honestly thought it would take a couple of seasons for him to have any impact but thus far, in limited minutes, he’s done much more than advertised. If D.J. White is your backup PF, giving you 14-20 minutes a night, you’re in good shape. If Byron Mullens is your backup C, giving you 14-20 minutes a night, you’re in good shape. If either of these two are your starters, you are in bad shape. Lesson: Re-sign both players to cap-friendly deals (White this summer, Mullens next summer), play them as upside backups and win games. Start them and lose games. The end. TIER TWO – WHAT DO WE DO WITH YOU? Tyrus gets his own sub-category. The team owes him another three years, $24 million AFTER this season. Mentally he’s as lost as ever (we expected that) but physically he looks borderline emaciated after an apparent offseason working out with Austin Daye and Angelina Jolie. This has all conspired to make Tyrus virtually untradeable. He’s owed too much for too long to amnesty so it looks like the team is stuck with him for at least the next two or three seasons. Sadly, the Bobcats still owe Chicago a first rounder in that time for his services. I want DBrown to be better than he is but the team is simply much worse while he’s on the floor. It’s hard to justify this with actual plus/minus numbers on a team that loses by twenty every night but anecdotally, Brown just doesn’t seem to understand the basics of the game – every other play he’s involved in ends with a turnover, missed shot or a foul. I’ve seen more than a few plays that tell me he’s a legit NBA player but Cory will absolutely need to work on a consistent jump shot to have any chance of staying in the league as a role player. Have very high hopes for Williams once he comes back in March. The team desperately needs a hot hand off the bench and that fits Reggie’s MO. Najera will be gone next offseason when his contract expires. In the meantime, he looks like a guy who took a wrong turn out of the YMCA locker room and ended up in TWC. Called on and paid well to do exactly one thing each and neither does that thing all that well. Fortunately, they’ll both be off the books come July ’13 and Diop at least has value as a semi-tough big in the meantime. With Augustin/Walker, Gerald Henderson and (eventually) Bismack Biyombo, the Bobcats are just two starters away from fielding a solid playoff contender. Unfortunately, those two starters will need to be ALL-STARs. The good news is that they’ll probably get one in this year’s draft. KU’s Anthony Davis, UCONN’s Andre Drummond, Baylor’s Perry Jones and Ohio State’s Jared Sullinger could all blossom into big-time NBA players and would fit quite nicely next to an emerging Bismack Biyombo at PF. UNC’s Harrison Barnes and KU’s Michael Kidd-Gilchrist could become the dominating offensive force on the wings the Bobcats desperately need. Combine Augustin/Walker, Henderson, Biyombo and one of the diaper-dandies above with max cap room this summer or next and the Bobcats could find themselves in a very favorable position sooner than later. Two franchises rebuilding from the ground up in the small market boonies. Two first round draft picks. Best player in collegiate gridiron; best player in collegiate hoops. 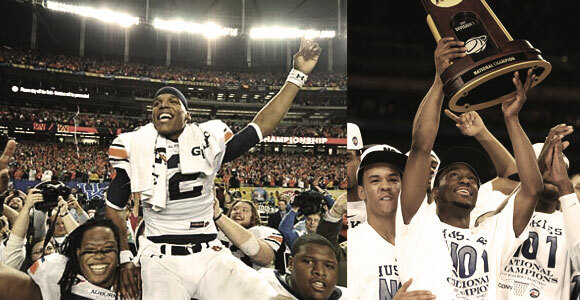 Two national championships. Two players second guessed by talking heads. Not ready for prime time, too short, too raw, two lockouts with too little time to prepare, too bad for the fans in Charlotte. Perpetual rebuilding. Something unexpected happens. Cam Newton struts out of the huddle in Glendale – nine eleven ten point oh-no that’s a seventy yard touchdown pass. Must’ve been a fluke – wait he just hit Steve Smith for another end zone bomb. Maybe we were wrong. Three TDs and four hundred plus yards later Cameron sets records and the talking heads start back-trackin’. Why ya’ll so surprised? He probably won’t do this every week but Jimmy Clausen won’t do this any week. Carolina fans rejoice – not only do they buy tickets, some start to show up for the games. This Newton character, he just might be The One. Twenty three years and three pro sports franchises later, Charlotte has never had One of them before. Maybe they’ll have Two. The NBA lockout ends. Kemba suits up in blue and orange. Hi-five from Rufus Lynx. Hey now. The lights turn on so he turns on; the bigger the stage, the bigger the man. He lives for this. Cam lives for this. Will the Bobcats name Kemba Walker their starting point guard? turns into D.J. who? The smallest one on the court wants the pressure. He needs it. Give me the responsibility – don’t be afraid of winning, I’ve done it before and it feels good. Let’s do it again. He falls often but gets back up more often. They are better than they should be but Kemba isn’t satisfied. Newton isn’t satisfied. It’s not enough. Two now. Getting better. A land of transplants. A sea of terrible towels, of Kobe purple & golds, of Lone Stars. In less than a generation they disappear year by year – replaced by sleeveless Fifteens and electric blue Ones. Two potential game changers, finally, after all those faceless seasons from Tripucka to Biakabutuka. No longer big-boxed replicas preening, manufacturing an image for fear of not having one at all. Better now. Two icons and entertainers. Originals. We take the hint. An identity all our own.